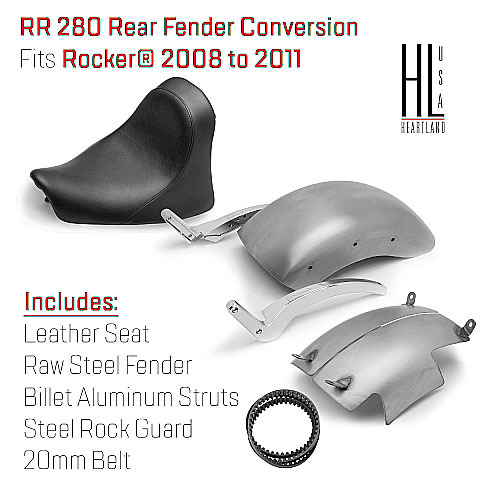 E-Z RR 280 Wide Tire Conversion allows you to add a 280 mm rear tire on a Rocker and Rocker C, Conversion includes: Billet Aluminum Slotted Struts, Raw Steel Fender and Raw Steel Rock Guard, Leather Seat, and a 22mm rear belt. Strut Finishes are Chrome and Satin Gray. Internal Strut Lights and length of the Fender. Wild Heart-short, Heartbreaker-Medium length, Heartlander- The Longest Fender, Heartland Is available with a Frenched Tail Light and License Plate Frame. For best results must use Custom Wheel from Heartland USA.